Iraqis walk at the Hamam al-Alil camp for displaced people, south of Mosul, on Wednesday, during an offensive by security forces to retake the western parts of the city from ISIS fighters. 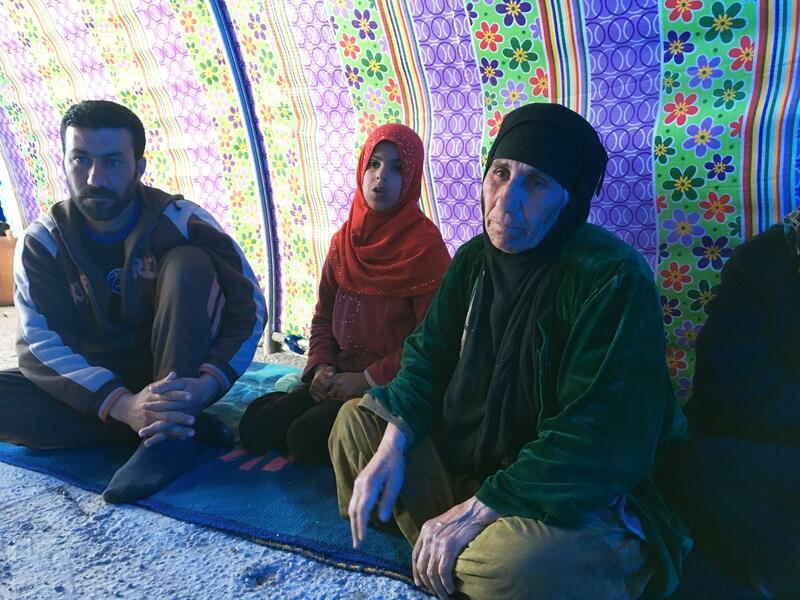 Amsha Mohammad (right) sits with her son Samir Khalil and a grandchild in a tent at a camp for people displaced from Mosul, Iraq. This week, a trickle of people fleeing the city turned into a steady stream of about 4,000 a day. A quickening flow of civilians is leaving the city of Mosul, fleeing fighting between Iraqi security forces and the ISIS militants who have held the city for more than two years. A total of 28,400 people have run away since an offensive to retake the densely populated western half of the city began Feb. 19, according to the United Nations Office for the Coordination of Humanitarian Affairs. Since Feb. 25, about 4,000 people a day have been escaping, the body said in a statement, the highest sustained daily rate of displacement since the struggle to retake Mosul began in October — on the eastern side. 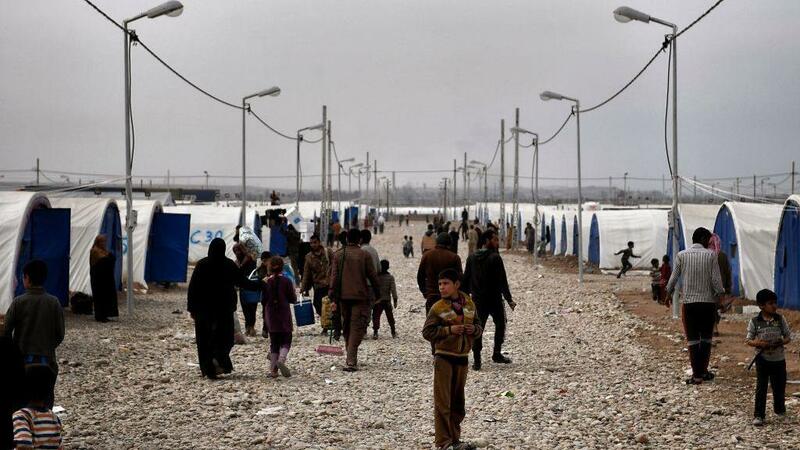 Most people are being picked up by Iraq's security forces and moved to camps in towns and villages south of the city. Aid agencies are scrambling to expand the capacities of the camps in anticipation of more people arriving soon. Estimates of how many people currently live in western Mosul vary. The number is certainly in the hundreds of thousands, and the U.N. says it may be as high as 750,000. At a newly built camp outside the flyblown town of Hamam al-Alil, south of Mosul, some of the first to arrive last week described appalling conditions inside the city — and a narrow escape. "It was a hard day," said Amsha Mohammad, surrounded by her children and grandchildren. "The army was here and ISIS was here, and we were trapped in the fighting for four hours." She said the numbers of ISIS fighters in the city is now relatively small — her guess was between 1,000 and 1,500 — but a group of 12 militants held off an army assault for hours. After they were defeated, the family begged the security forces to help them. "They told us, thank God for your safety, and brought us here," she said. Her son, Samir Khalil, a laborer, said he had followed the news by listening secretly to the radio on a phone that ISIS would have killed him for having, if they'd found it. So he knew that if they waved white flags, the security forces would help them. Shaking his head, he said they had experienced terrible hardship under the militants. Government salaries and supply routes were cut off and food had become scarce. Then, five months ago, ISIS forced them out of their homes on the edge of the city and moved them into a vegetable market farther inside the city: a tactic that provided the militants with human shields. "We ate flour mixed with dirty water," said Amsha Mohammad, his mother. Her face contorted with disgust. "It made us sick." Their homes are in an area that is now retaken from ISIS, although heavily mined. They plan to go back. "I'll return to my house, with ISIS gone," Amsha Mohammad said, practically spitting with rage as she described how the militants killed people for the smallest infractions of their rules: a secret cigarette, a woman's uncovered hand. "If I catch any ISIS," she said, "I will kill him. I will eat his flesh." Next, we report on the lives of people in a war zone, the city of Mosul, once captured by ISIS, now under attack by Iraqi security forces backed by the U.S. Hundreds of thousands of people still live in that city. And NPR's Alice Fordham reports there's a surge in people fleeing. ALICE FORDHAM, BYLINE: Behind a metal gate on the outskirts of the flyblown town of Hamam al-Alil are rows of hastily constructed tents. We are a few miles from the frontline of the assault on Mosul. And people who are fleeing the battle are beginning to arrive. FORDHAM: This family showed up a few hours ago. The grandmother, Amsha Mohammad, tells me they were caught in crossfire. AMSHA MOHAMMAD: (Foreign language spoken). FORDHAM: "It was a hard day," she says. "The army was here. And ISIS was here. And we were stopped for four hours." They are from a village nearby, so I ask if the battle was there. FORDHAM: "No. We were inside Mosul." She says ISIS had forced them out of their village months ago to be human shields. They were sleeping in a vegetable bazaar, eating dirty water mixed with flour to survive. ISIS took Mosul about two and a half years ago. Iraqi security forces retook the eastern half of the city in January. But the fight for the more densely populated west is only just gearing up. The United Nations says nearly 30,000 civilians have fled in less than two weeks, a sharp uptick that could mean many more will follow as the fight moves to the city center. Amsha Mohammad, that grandmother, says everyone will welcome the security forces. People have been living in misery. FORDHAM: "I'll go home without ISIS," she says. She tells me they kill people for having a SIM card, for smoking a cigarette because a woman didn't cover her hands. The tent we're in is purple and green. And as the sunlight filters through, it turns her furious, wrinkled face lurid colors. FORDHAM: She practically spits as she says, "if I catch anyone from ISIS, I will eat him. I will eat his flesh." Alice Fordham, NPR News, northern Iraq. Transcript provided by NPR, Copyright NPR.